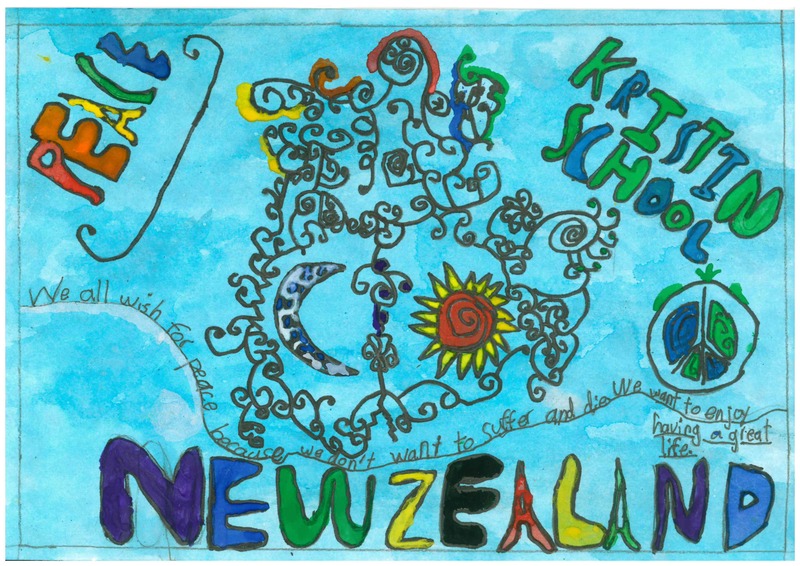 We have received a number of lovely drawings and designs from the Kristin Junior School in Auckland, New Zealand. We all wish for peace because we want no war. 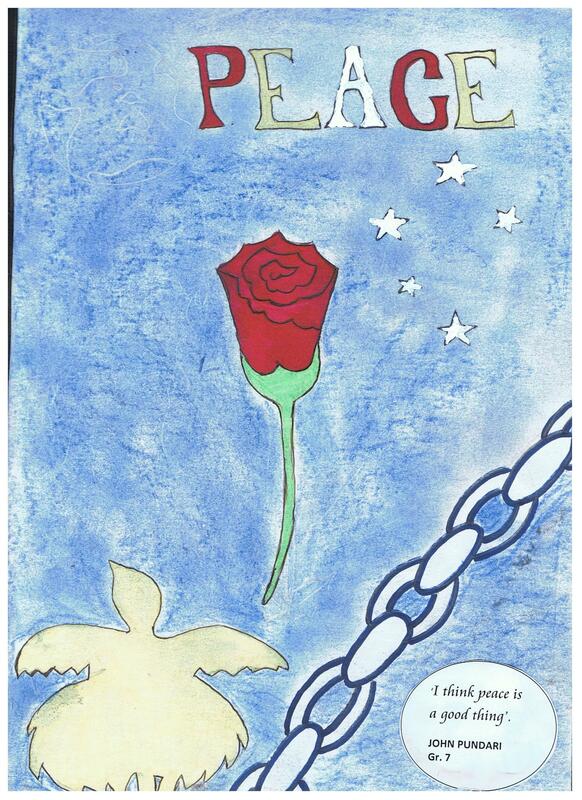 We all wish for peace because without war the world is beautiful and free. We all wish for peace because we don’t want to suffer and die. We want to enjoy having a great life. We all wish for peace because life becomes much easier if you accept apologies you never get! 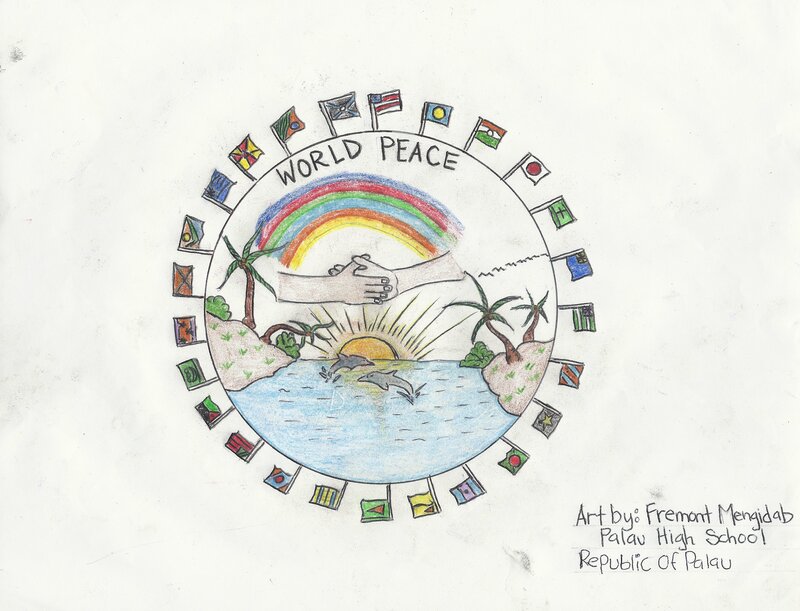 We want to bring peace to the world because the world needs peace to grow. We all wish for peace because peace means a happy life. We all wish for peace because no one wants to get hurt. We all wish for peace because its better than fighting. We all wish for peace because when there is peace all animals are safe and sound! 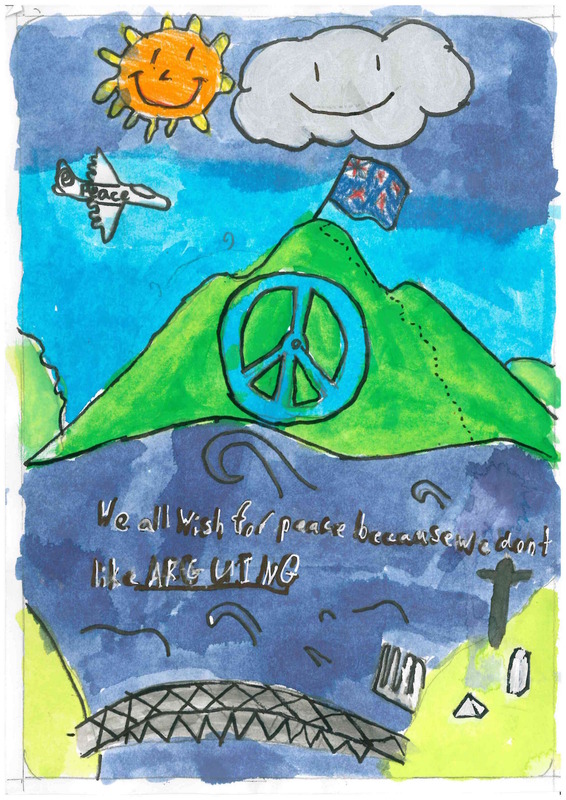 We all wish for peace because we need to stop war to be kind. We all need peace because we don’t like to suffer loss as in wartime! 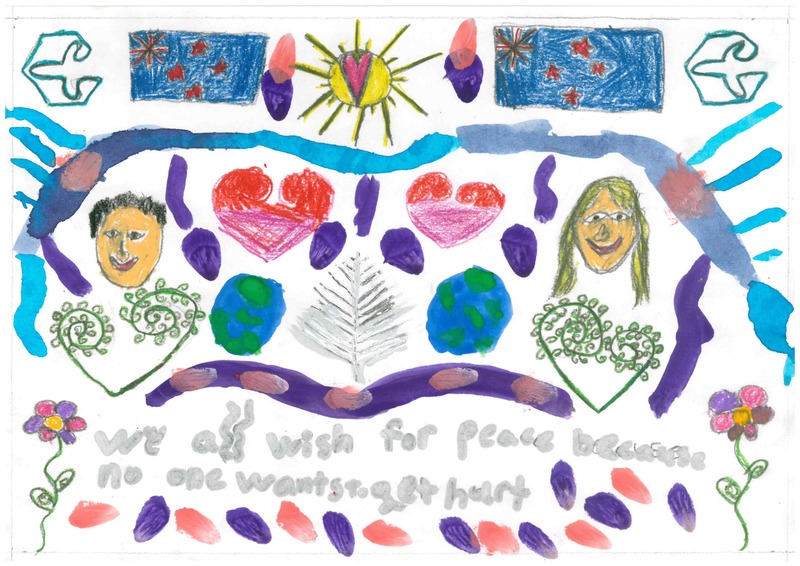 We all wish for peace – Bring peace not war. We all wish for peace because we don’t like arguing. Peace is good for us. If you don’t show peace nobody will show peace. 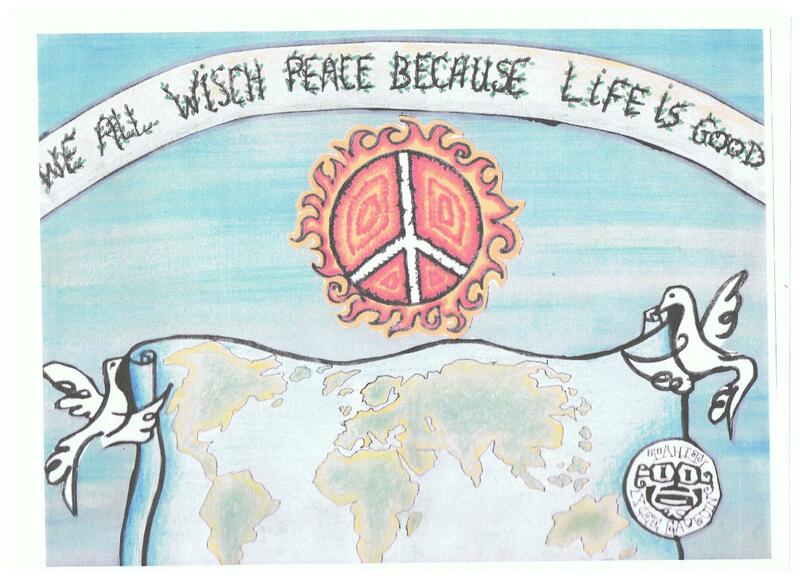 We all wish for peace because we want peace for all. A huge thank you to Principal Diana Patchett for agreeing to take part, to all the students for their wonderful work and to Timea Willemse Visual Arts and Jane Sargeant Year 3 Teacher who assisted. 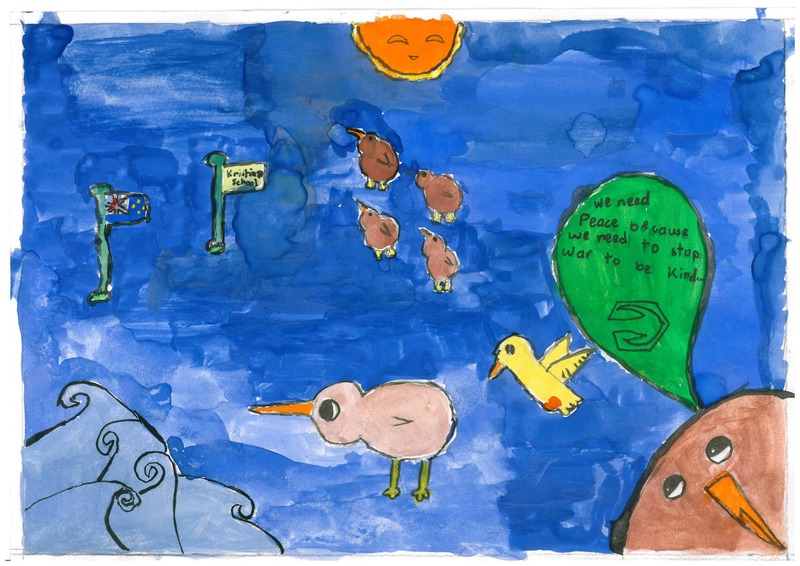 The school logo of a stylised dove has been used to great effect in the children’s designs. 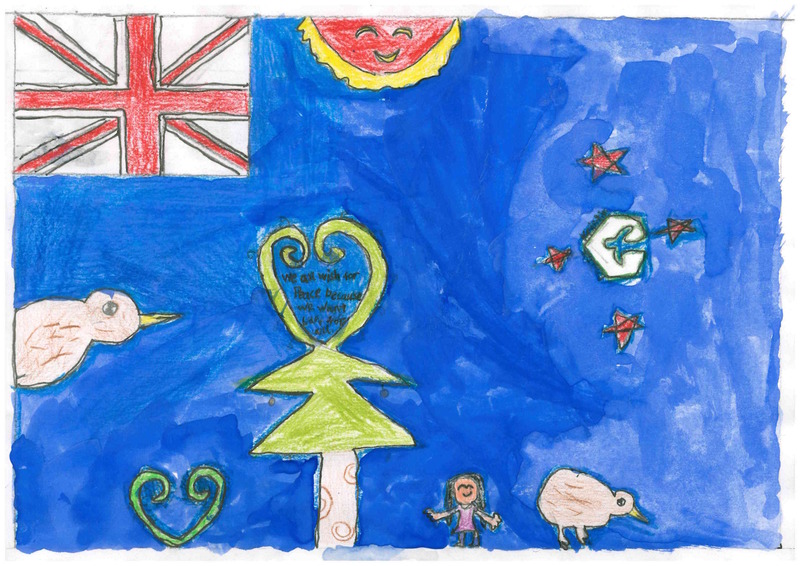 The flag of New Zealand consists of a dark blue base with a British Union Jack in the upper left quarter. On the right side of the flag are four, five-point red stars outlined in white. The stars are positioned to represent a southern cross. 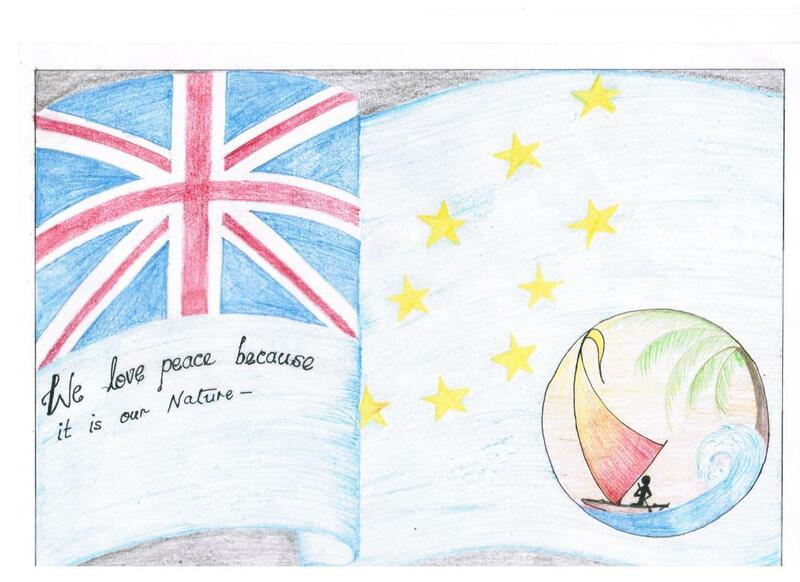 From the Students of Lycee Paul Gaugin School in Tahiti, French Polynesia we received this message. “We are grade 10 students studying at Lycée Paul Gauguin. We are three girls, Hania, Heiariki and Leiali’I speaking on behalf of our classmates. 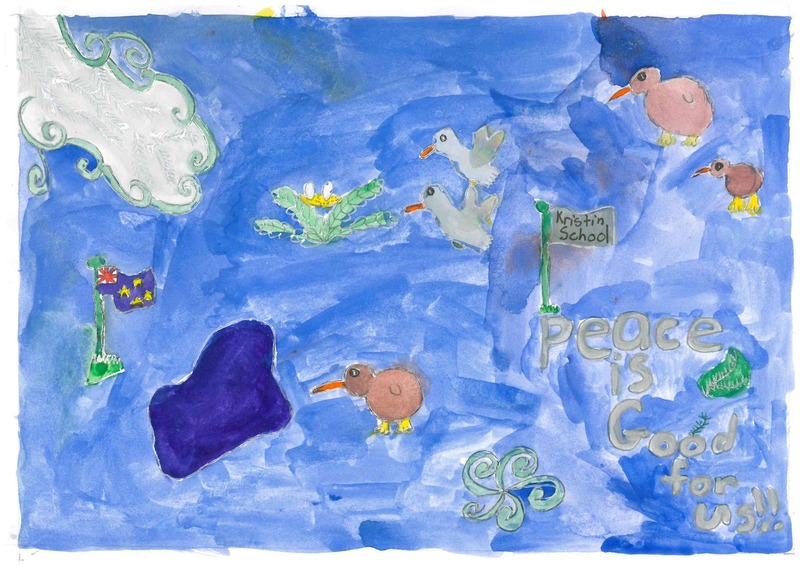 Last month we worked on the LPG Peace Quilt 2015, we drew drawings to show what peace means for us and we organized a poster contest. We did all the project with our English teacher in English class. The students of grade 10 at LPG. 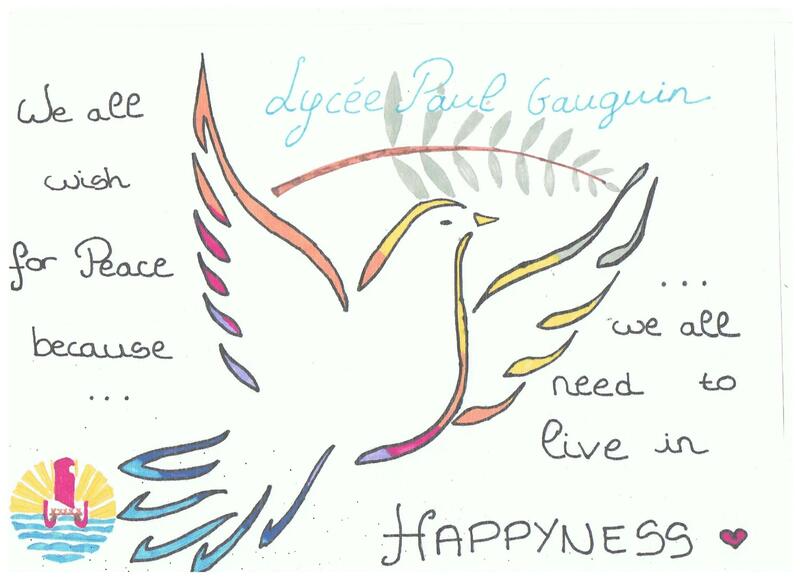 Following are the submitted writings from the students of the Lycee Paul Gaugin School in Tahiti. 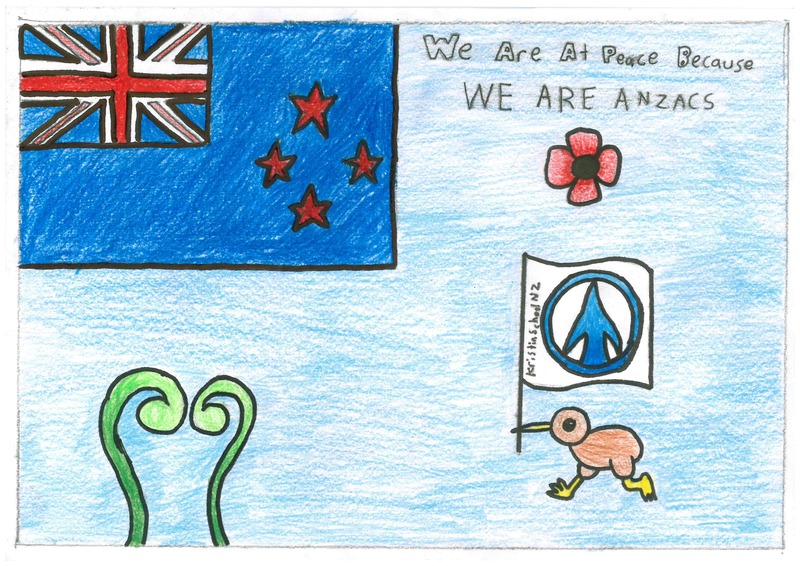 When we drew our drawing we wanted to do something original and to participate in the peace quilt and Peace day. 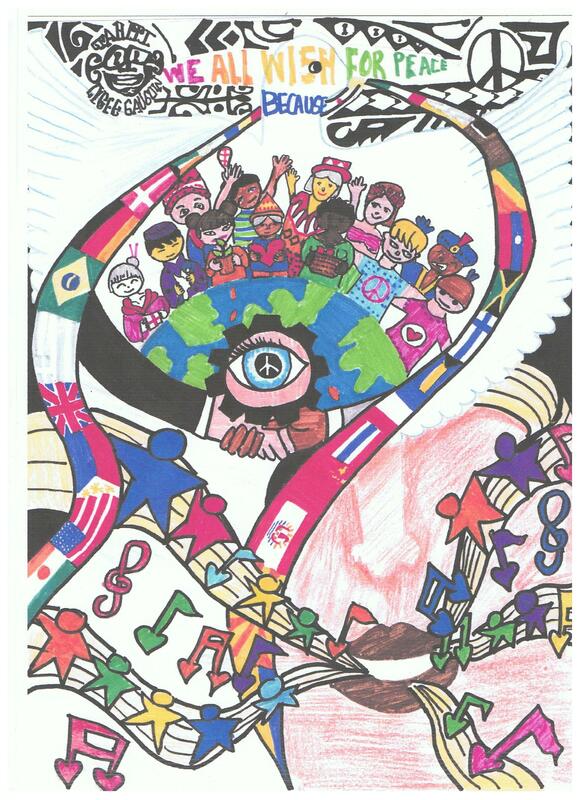 We chose this drawing to represent the LPG school on the International peace quilt 2016 Rio Games. Peace is important for everyone, because without peace maybe there are wars in all countries. It’s important to have a good relationship with others. Without Peace there is no world heritage, education, equality and we aren’t free. IF YOU WANT TO BE FREE, FIGHT FOR PEACE. We think peace is important because violence prevents communication, agreement; it even prevents negotiations. Communication is the basis, we don’t need wars to resolve problems, because that doesn’t resolve anything! That makes deaths, blood, tears, despair. The world doesn’t need despair, it needs love and sharing. In our mind, peace is important because without peace we will die with the wars in the world. To be happy and solidarity we need peace. When we are in peace we are not racist too. Anywhere and anytime, war is present. Nobody can escape war, anywhere we go, someone can kill us, for any reasons. Today, some countries are at the war, because peace isn’t present, they are not peaceful. At school, some students bully the others, and it’s too bad because the victim can be suicidal. Bullying isn’t like peace. 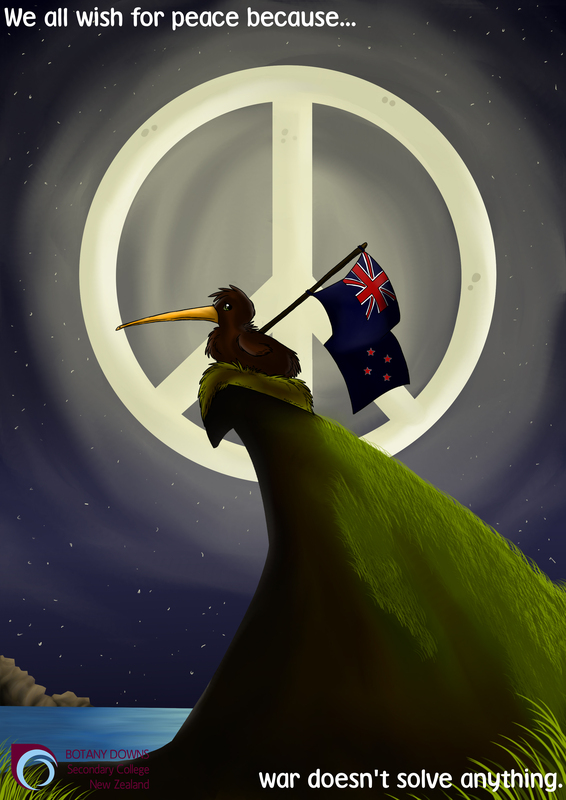 WE NEED PEACE IN THE WORLD ! 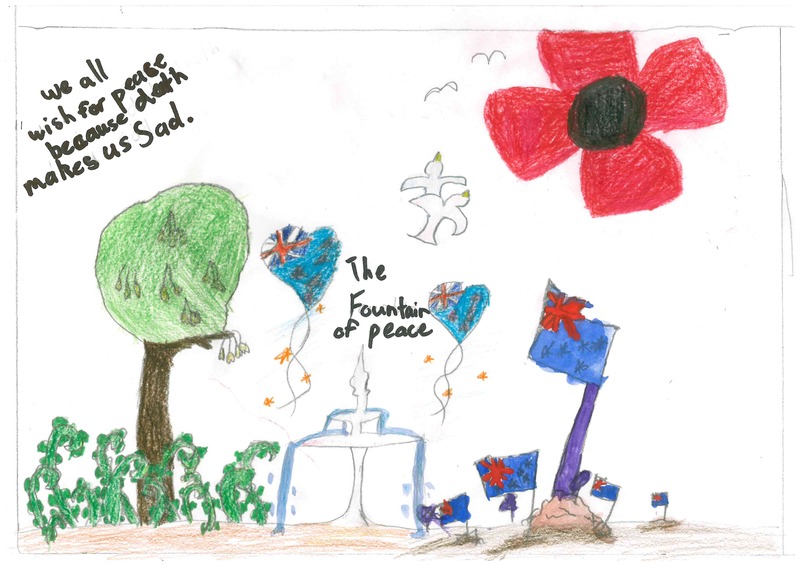 1) Our drawing is a peace message for the countries at war to stop violence. There are lots of victims killed by terrorists or bombs. The war is scary. It’s unfair that we live in security, happiness, love and harmony in French Polynesia while teenagers in Iraq for example are massacred. 2) We need peace to have a better life and a better world. Peace is essential for a good harmony in our world and happiness for everybody. We need peace because wars destroy our world. Wars get out of the way and let peace in the place! 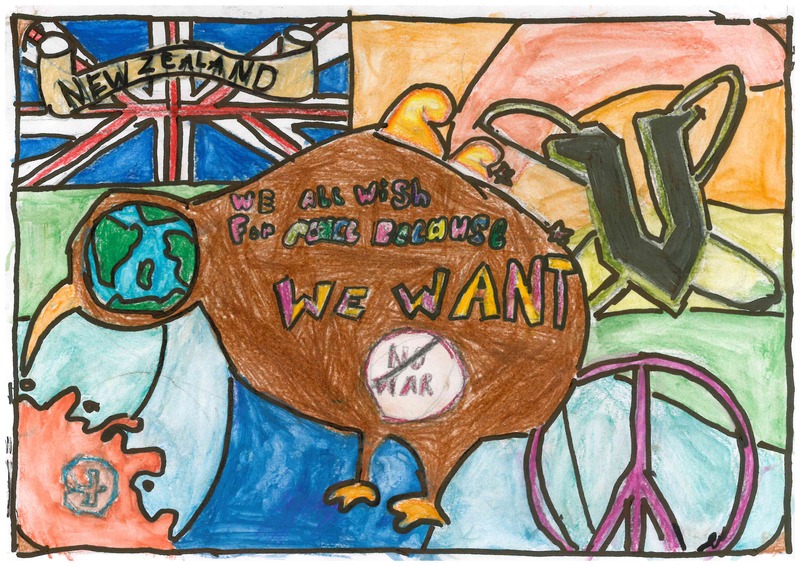 1/When we created this drawing, we wanted to pass a message for the countries at war. The message is to stop war, the violence, fighting, because violence represents death. 2/At the beginning, it was homework for us. After, we realized that it was important. Peace is important for the functioning of the world because all people should be equal. The word peace means love, happiness, being together. 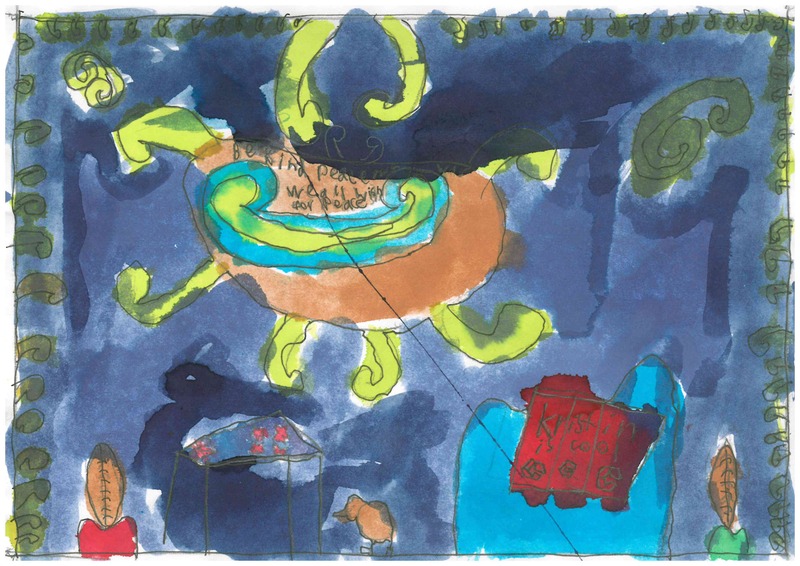 Above are some of the many drawings produced by the students of Lycee Paul Gaugin School in Tahiti. 1) We thought about peace symbols because everybody understands the symbols, even if other people don’t speak the same language. 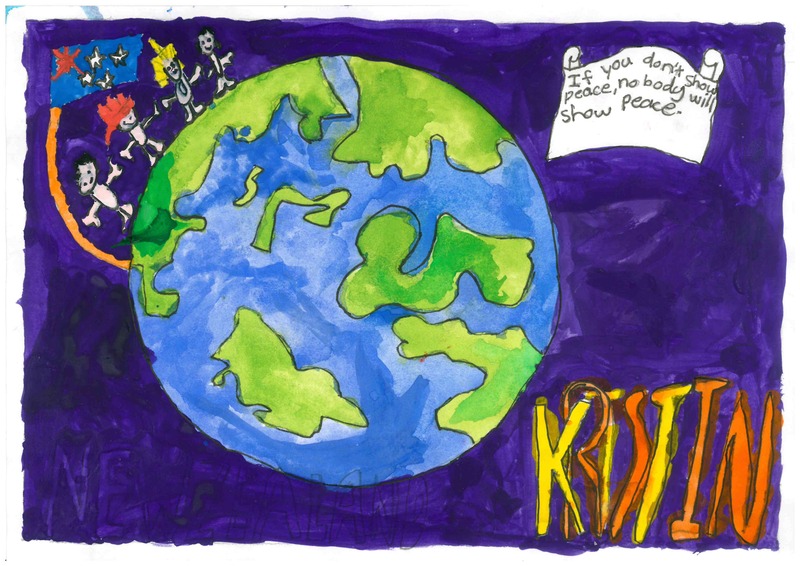 2) We think peace is important because we all want a better world. Wars create a lot of wounds, destruction and despair. War shows humanity’s dark side and all the worst they are able to do. The motive to fight is often useless, stupid. We are always scared with war. Everybody needs to feel protected, safe and to be equal. We are afraid to be killed or to lose the people. War is not fair. We need peace to live together without wars. A special thank you to all the students involved and to Caroline Vonsy, English teacher, for coordinating the project for French Polynesia. The French Polynesian flag depicts a canoe (piroque), sailing under a golden sun. Its crew of five represent the five island groups: the Austral, Gambier, Marquesas, Society and Tuamotu chains. Red and white are traditional Polynesian colours. Thank you so much to Schools all over the World for your participation in this Project. This is an article by the Times paper in New Zealand highlighting Botany Downs Secondary College’s wonderful contribution. Well done to Demi, Jennifer Kirkham her teacher and all involved. Great work and a delight to receive such an inspirational design. Good luck to Demi for everything She does in the future . 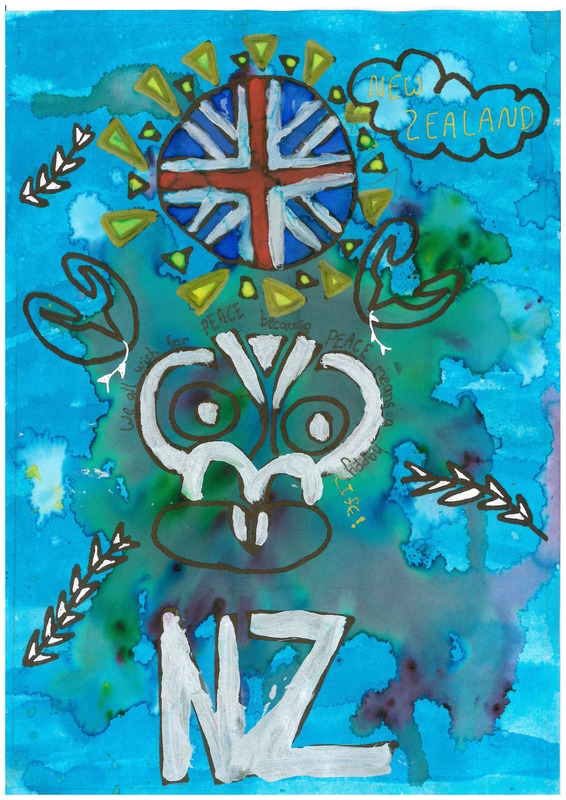 We are delighted to receive designs from Ela Murray International School, Papua New Guinea. Unfortunately some of the pieces went missing the end of last year but thankfully some were found again and have now been received. This one of the lovely rose has been done by John Pundari. Thank you so much to everyone from the Ela Murray International School for your participation. A competition was held to design a flag for the country in 1971. 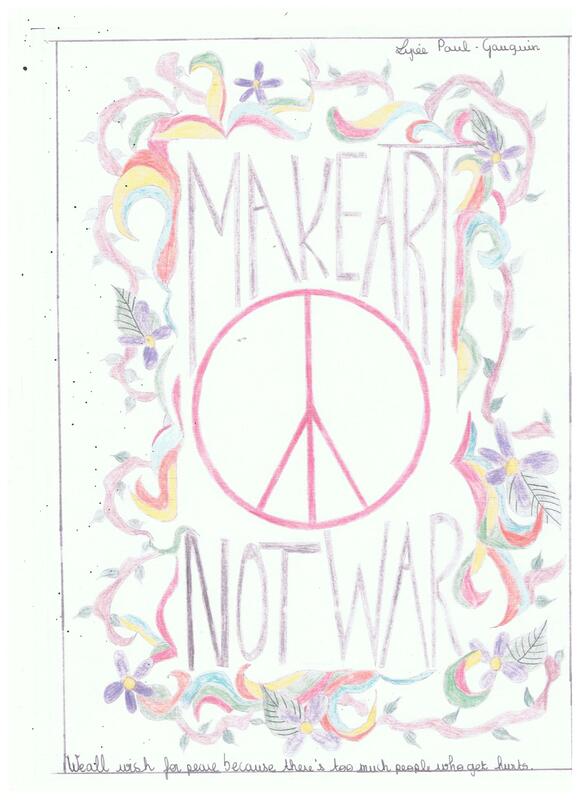 The government approved a design submitted by local art teacher, Susan Karike. It became the national flag upon Papua New Guinea’s independence. 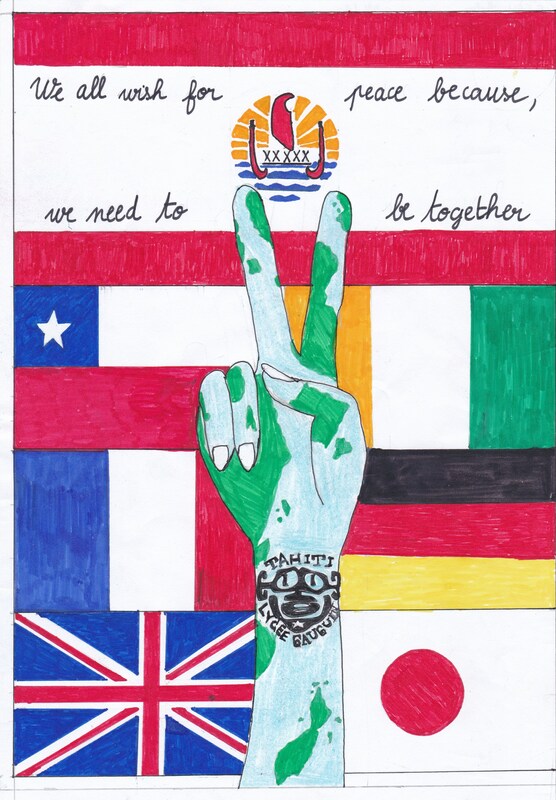 Thank you to the students from Palau High School in The Republic of Palau for their contribution to The International Peace Quilt. Well done to Fremont Mengidab for this first one which includes a colourful rainbow,flags of many different Countries,and the islands. 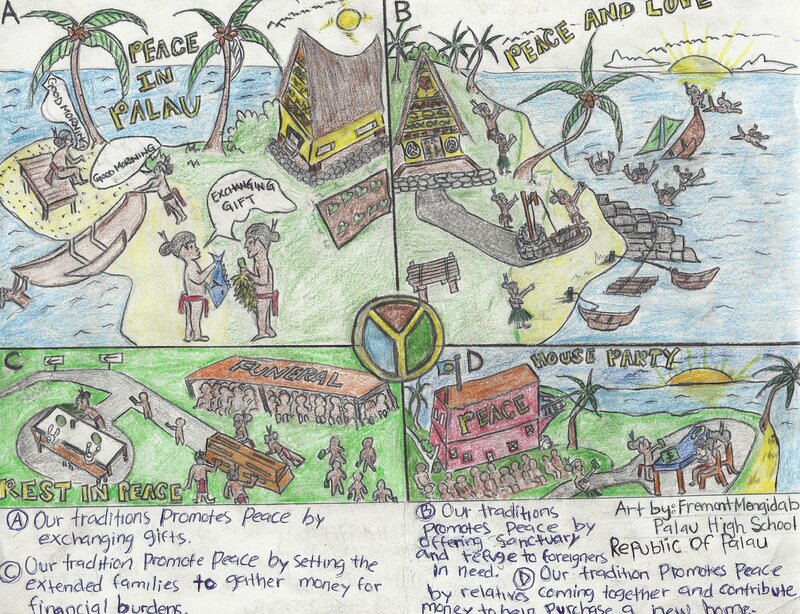 This drawing has also been created by Fremont and describes the many different ways Peace is shown in Palau. A.Our traditions promote Peace by exchanging gifts. B.Our tradition promotes Peace by offering sanctuary and refuge to foreigners in need. C.Our tradition promotes Peace by setting the extended families to gather money for financial burdens. D.Our tradition promotes Peace by relatives coming together and contribute money to purchase a new home. Thank you so much to Ibuuch Tomoichi Principal of Palau High School for coordinating the International Peace Quilt for Palau. 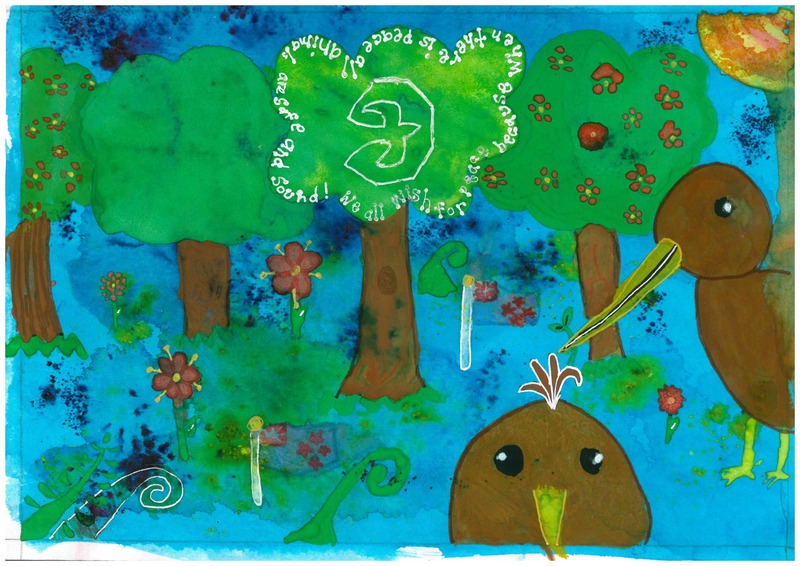 Here we have an environmental friendly drawing from young children in the Rurubao Primary School in Bairiki,Kiribati. 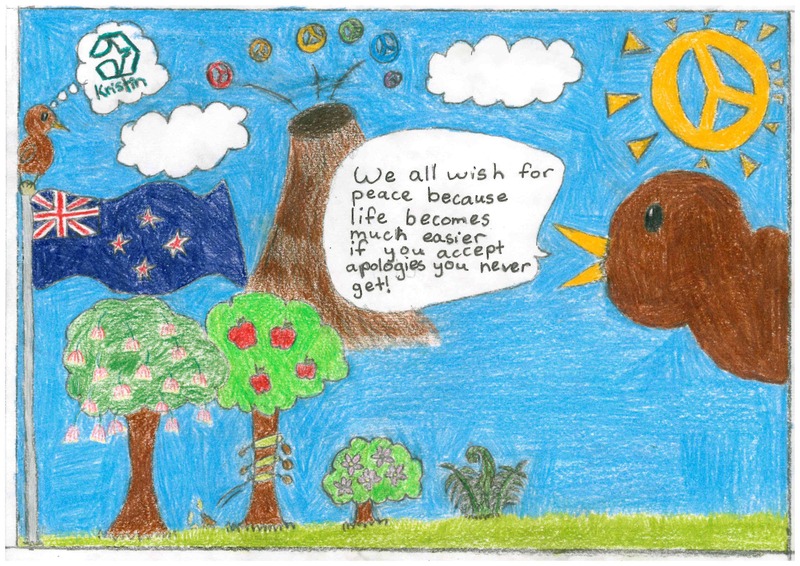 We all wish for Peace because “we want to be happy with our families and friends”. This used to be an international school but is now attended by local children. Special thanks to Ms Meaua Tooki Secretary General,Kiribati Red Cross Society, Betio, Tarawa for coordinating the project for Kiribati and helping to have a voice for Kiribati children on the Quilt. Kiribati is very environmentally driven and understandably so as The Republic of Kiribati consists of 33 coral islands and is located in the central Pacific Ocean halfway between Hawaii and Australia.Kiribati has few natural resources and most families live on a day to day subsistence from fishing and gathering fruits and vegetables such as bread fruit, coconuts, Tara roots, and other native plants that grow naturally. Some families have a small garden by their homes, others work, have part time employment or sell fish, hand crafted, gifts, and other homemade products along the road side. Employment opportunities are very limited. The nation relies very much on foreign aid from Australia, Taiwan, and other countries. This is a very recent picture with some of the children having received some dictionaries from the Utah Rotary Club. 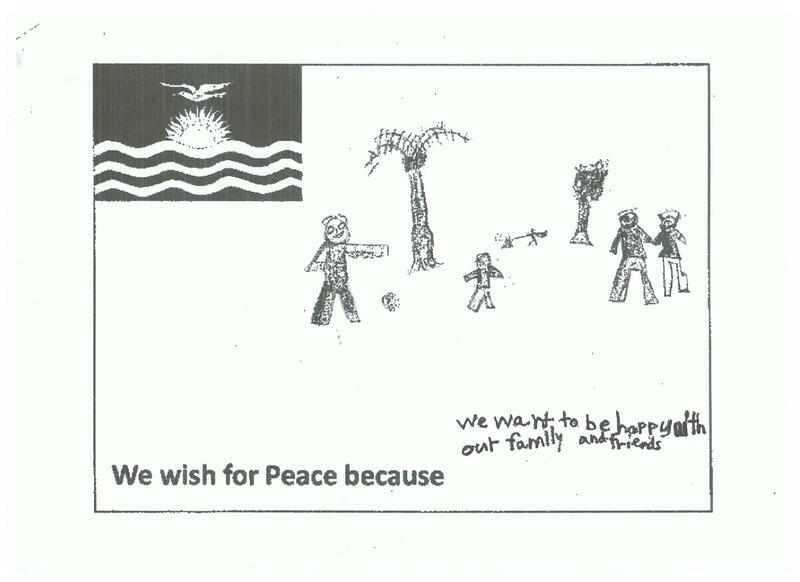 Thank you to everyone from Motufoua Secondary School Vaitupu in Tuvalu for this drawing to represent their young people’s wish for Peace. 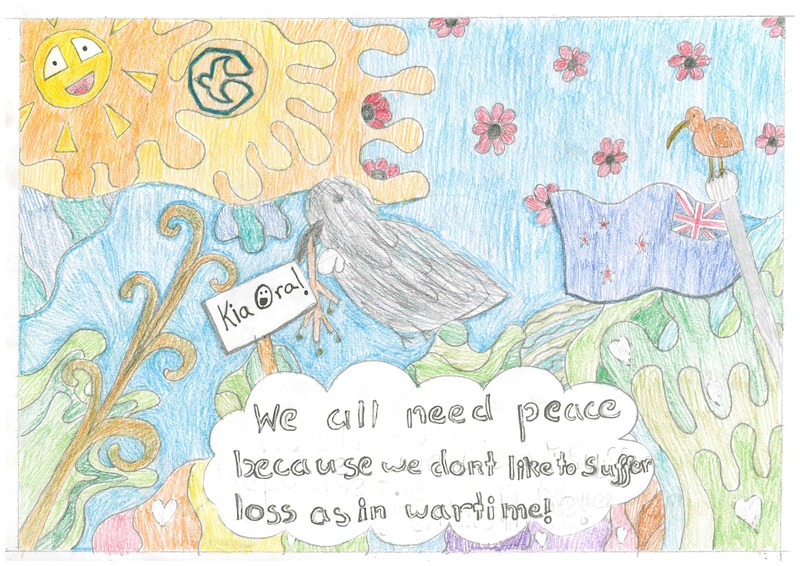 Thanks also to Siautele Lito for organising the International Peace Quilt Project for Tuvalu. 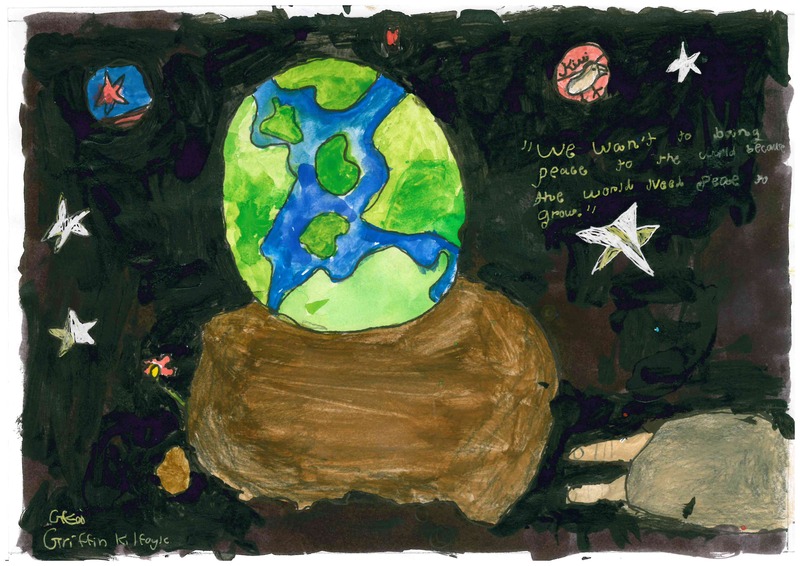 The schools vision………. By 2015, guided by strong spiritual values enshrined in its motto….TUVALU MO TE ATUA…. we will have achieved a healthy, educated, peaceful and prosperous Tuvalu. The current (and 1978 version of the) Tuvaluan flag is light blue ensign (like that of Fiji), possibly representing the colours of the tropical oceans around the islands. It bears nine stars for the nine islands of the archipelago (although only eight were originally inhabited, hence the name Tuvalu [“eight islands” in Tuvaluan). The disposition of the stars generally follows the geographic arrangement of the islands if the flag is hung from the hoist (i.e., the islands lie in a northwest-southeast chain). 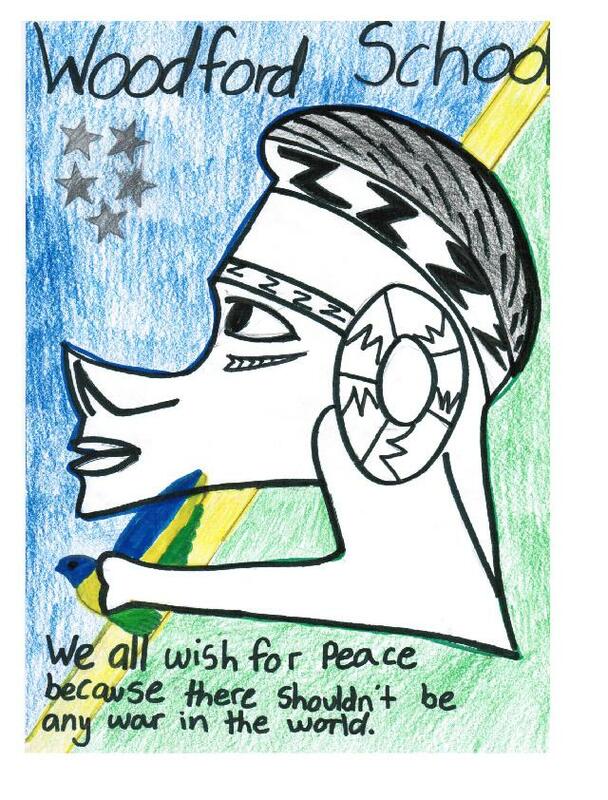 It is not known why some stars point upwards, and others downwards..
We very much welcome the drawing from Nauru Secondary School, Nauru to join in the International Peace Quilt. The school held a drawing competition for which all the drawings were excellent. Nauru Olympic Committee Executive board selected the winning drawing. The school held their presentation through Nauru television at the Nauru Secondary School Hall. Thanks so much to Rachel Bornillo year 10 for this drawing. 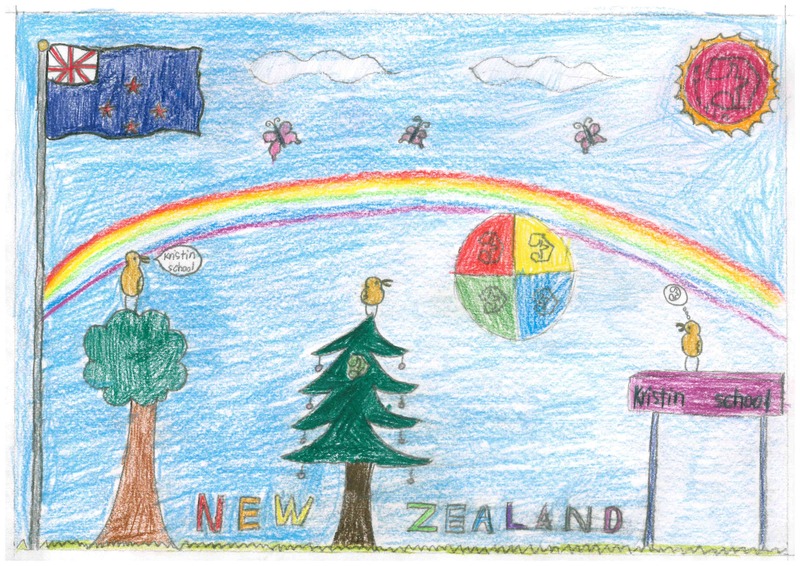 The drawing Shows, the world at peace, The Nauru Flag, and Nauru Emblem. We reached this contact through Edwina Ricci from Oceania Sports development who put us in touch with Dominic Cain Nauru sports development officer and a member of the Nauru Olympic Committee and to Marissa Cook Chef de Mission for the London Olympics. Thank you all for helping us to have young people of Nauru included. The Nauru flag represents the country’s geographical position in the world. Nauru is represented by the star and it is just south (26 miles) of the equator (the yellow stripe) in the central Pacific Ocean (the blue base), slightly west of the international dateline (the star is off centered towards the left of the flag). The 12 points on the star symbolize Nauru’s 12 original tribes. 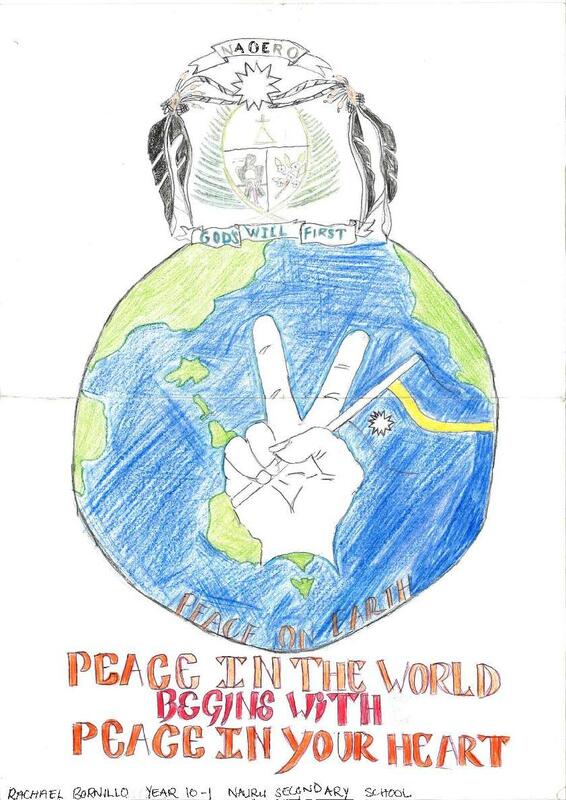 Thank you to everyone in Woodford International School Solomon Islands for these drawings. 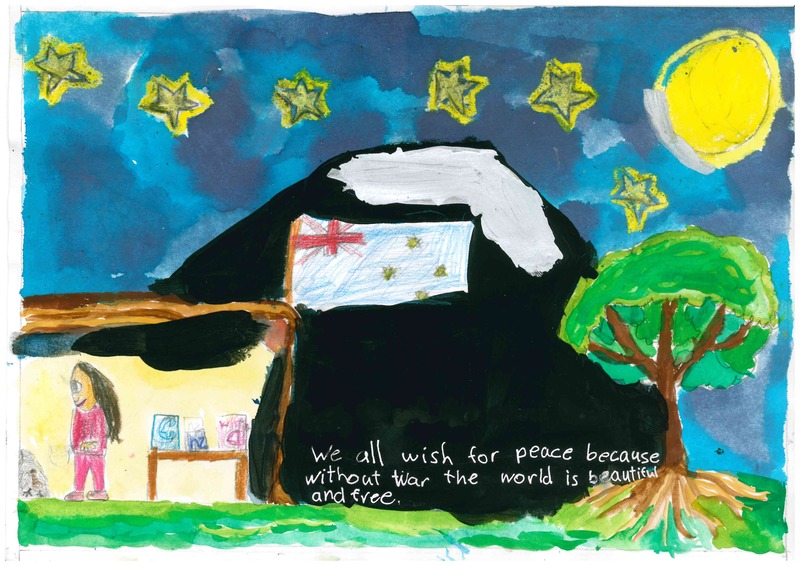 We all wish for Peace because we want all the Countries to be united as one. We all wish for Peace because there shouldn’t be only war in the World. Both these wonderful drawings have been done by grade 6 girls. “I will explain a little what the girls have drawn. The canoe in the picture is a means of transport they use here in the Solomon Islands. Long time ago people would visit other islands in their canoes. If the canoe had a Nguzu Nguzu (which is a symbol of the Solomon Islands)on the front holding a scull, the people came for war. If the Nguzu Nguzu was carrying a dove, they came in peace. 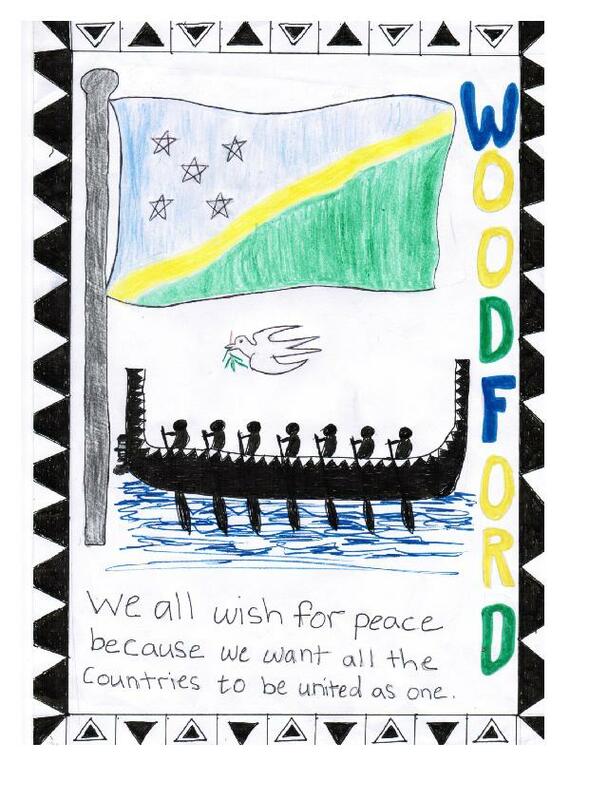 The canoe on the picture has a Nguzu Nguzu on the front holding a dove.